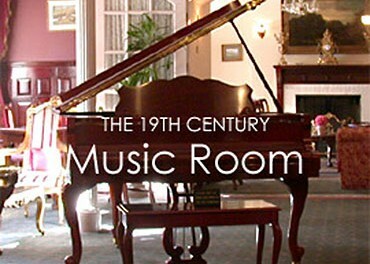 A MUSIC ROOM — To deserve its title, a Victorian music room was furnished with a sympathetic understanding of the art it represented. The first provision was, naturally, for the performer. The placing of the piano was of importance, and the best rule to follow was that observed on the concert stage, where the soprano part of the keyboard was always toward the listeners. After the comfort of the performer was assured, the comfort of the listener then received attention. Seats that were restful and a light that is pleasantly tempered were the two main considerations. Read more here.